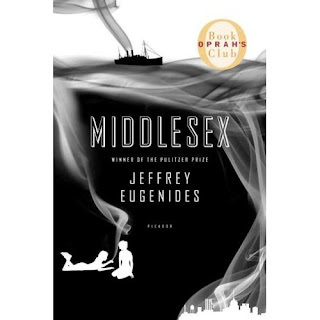 Middlesex by Jeffrey Eugenides is a book I have been meaning to read for a while. I thought for some reason that the book was written years ago when in fact it was recently written in 2002 and won the Pulitzer Prize for fiction. This fictional account traces the Greek family history of Callie (Cal) Stephanides, a hermaphrodite who struggles with his sexuality throughout his entire life. The Stephanides gene pool is infiltrated with intermarrying, this is what Cal blames for his condition. Cal's grandparents were brother and sister who migrated to the United States from Turkey and his parents were first cousins. Supposedly, back in Greece some of his ancestors were born with both male and female genitalia, but this was never verified. When Callie is born he is deemed to be female. His doctor fails to recognize that he does in fact also have tell tale signs of male reproductive organs. Callie leads a relatively normal and happy childhood. At times he feels different and finds women to be more attractive then men. It isn't until the age of 14 when Callie visits a specialist in New York, that he changes his name to Cal and begins to lead a life as a male. Although parts of this book were a little long I found it incredibly interesting to read about the struggles and hardships of being a hermaphrodite. Many experience shame, depression and feel ostracized. This book, however, is about the importance of finding hope and peace with oneself! You've got a great blog, by the way. I'm a big reader, too (when I'm not in writing mode.) I'm going on a blog tour soon, give me an email - I could stop by your blog if you'd like!